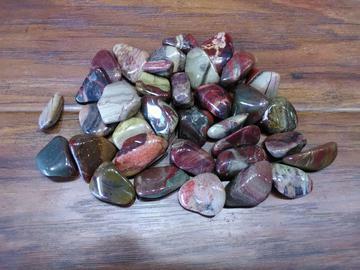 Rainbow Jasper is a gemstone that provides protection for your aura and Chakras. The stone guards against malicious thoughts, psychic attacks, and dark energy. Rainbow Jasper expresses creative thoughts, love and inspires freedom. The stone helps you to feel lighter, more peaceful, and connected with the gentle energies of the Universe. Rainbow Jasper is a beautiful blend of black, brown, clear, green, red, and silver. Size: 1/4" - 1 1/14"